67 out of 111 judges voted for Danishevska's candidacy. 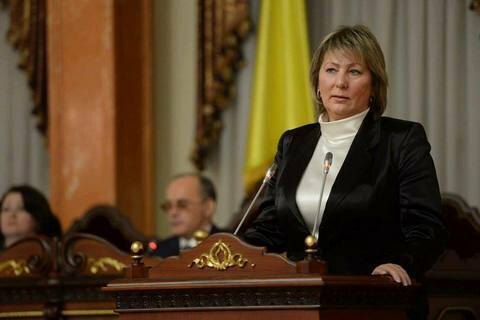 Valentyna Danishevska was elected the chair of the Supreme Court during the televised plenum of the Supreme Court on Thursday, 30 November. Previously, Danishevska was judge of the Cassation Economic Court in the Supreme Court. Earlier, she worked as a judge of the Arbitration Court of the Zaporizhzhya region, but in 2011 she founded and headed the charitable organization Commercial Law Center. In 2015 Danishevska was elected to the Public Council under the Justice Ministry of Ukraine. Danishevska was a judge of the permanent arbitration court at the Association of Ukrainian Banks. Danishevska told reporters upon the ballot that she has long doubted whether she should run for the post. She said she was yet to decide on candidatures of her deputy and the secretary of the Supreme Court. Danishevska won the secret ballot in a contest with two other nominees, both judges cassation courts in the Supreme Court - Arkadiy Bushchenko and Volodymyr Kravchuk. The Supreme Court will start working on 15 December.